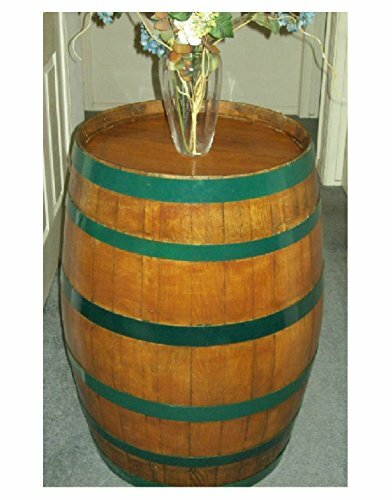 The only Decorative Barrel like this on the market, this rare and stunning piece is better than any new wine barrel could have ever looked. These reclaimed former used wine barrels are scuffed, stained, sealed and varathaned - leaving as much history of the wine barrel on it as possible, yet bringing a new luster and look to what already was a winemaking wonder. Likes its natural band cousin, the hoop bands are sanded, but then are painted with your own color option - they usually come with six bands. 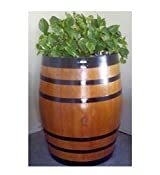 The roughly 35" by 28" barrels used to be 225 liter (58-60 gallon) wine barrels direct from wine country here in California and can be used as a table or strictly a conversation piece. The pictured barrels are examples only and may not be exactly the same as you purchase. Also, note that although we state it can take six to 10 days to create one of these, unless we're backed up, we can usually get these out in less than a week of ordering.